Members of the opposition SAD-BJP and AAP walked out of the Punjab assembly on Friday to denigration of Sikh principles the day before when some MLAs were forcibly evicted from the house and turbans of some of them came off in the process. As question hour began, SAD-BJP and AAP legislators were on their feet, seeking a debate on yesterday’s incident when the speaker ordered that legislators of the Aam Aadmi Party be taken out by marshals. In the melee, the turbans of some of the members came off. Furious at what had happened, opposition legislators described what happened as “hurting the religious sentiments” of the Sikh community. Demanding a debate, Leader of Opposition H S Phoolka and Shiromani Akali Dal president Sukhbir Singh Badal said it was a denigration of Sikh principles. SAD members carried placards in their hands and also wore black over their clothes to mark their protest. Speaker Rana P P Singh asked the opposition to stop raising slogans and assured them that he would take a decision on their demand after question hour was over. Opposition legislators were unrelenting in their demand, however. SAD-BJP members, followed by AAP, gathered near the speaker’s podium, raising slogans even as question hour continued. They later trooped out of the house. Sukhbir told reporters later that the speaker should tender an apology for yesterday’s incident. “Tossing of turbans is an insult to Sikh symbol and article of faith. The speaker should apologise to members of the House and people of Punjab,” he said. He also demanded an apology from Chief Minister Amarinder Singh as he was leader of the House. SAD members, he said, would meet Governor V P Singh Badnore seeking dismissal of the government. 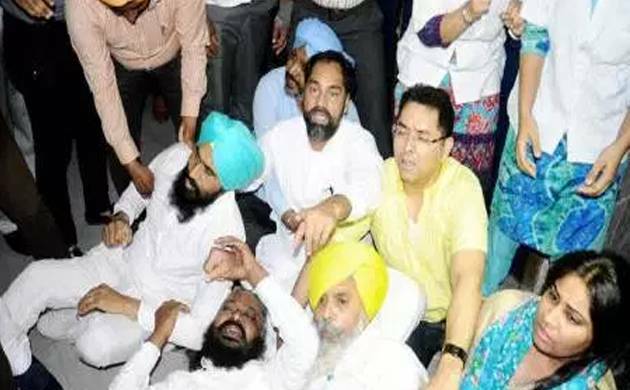 AAP legislators were yesterday protesting their chief whip Sukhpal Khaira and LIP leader Simarjeet Singh Bains being stopped at the assembly gate. Both were suspended last week. In the trouble that followed, some AAP legislators were also injured.